Ask your students to describe what an apple looks like. Some are red on the outside. Some are green. Even if the outside skin of an apple is a different color, does the inside look the same? 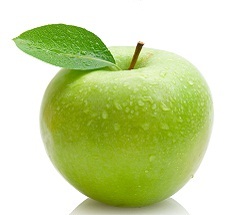 The inside of the apple is a pale, off-white color and contains the seeds in the apple core. Ask your students to describe what something looks like when it is rusted. Brainstorm words that describe what rust looks like. Now, explain that rust occurs on metal objects when they are exposed to the elements of oxygen. The same process of corruption happens to food. When the inside of an apple is cut, exposing the inside surface to the oxygen in the air, a process known as oxidation occurs. The oxidation that happens on the cut surface of a fruit can be prevented by removing the oxygen from the equation and vacuum-packing the fruit, adding heat and cooking the apple slices, or by coating the surface with an acidic liquid, like lemon juice. Share the information with your students that oxidation is a destructive process that starts to break down the chemical composition of food. It discolors the surface of food and makes it visually unappetizing. Ask students what they think can be done to slow or stop the process of oxidation. Cutting an apple into slices releases an enzyme that mixes with the properties in oxygen and starts the process of oxidation. The scientific name for this enzyme is called polyphenol oxidase. It is the reaction from this enzyme coming into direct contact with the oxygen in the air that causes a fruit to start to spoil. Explain to your students that they are going to make observations of apple slices at various intervals of time. They will be making observations of what happens to apple slices, when they are left on a plate exposed to the air, for various recorded amounts of time. To begin the demonstration, cut an apple into slices. Have your students take note of the appearance of the apple slice. Ask them if the apple slices look like something they would want to snack on. Place the apple slices in a controlled environment, where they won’t be disturbed, like a table in the classroom or a windowsill. Observe any changes in what the cut slices look like after 30 minutes. Tell your students to make notes from their observations and ask what they see happening to the apple slice as it sits exposed to the air. Wait another 30 minutes and check the appearance of the apple slices again. Ask students to make observations and compare to the last observation. Repeat this observation method two more times so that students have a set of four different observation times. Ask them what they notice in changes during the time that has passed. After the four observations, ask your students if the apple slices look like something they would want to eat. The lemon juice is chock full of absorbic acid, or vitamin C, and it has a low PH level in the 2.0 range. The enzyme, polyphenol oxidaise, will be prevented from being activated with the oxygen in the air, when mixed with the low PH level. This enzyme thrives in a PH level of 5.0 to 7.0. The lemon juice will delay the process of browning in the fruit from the acidity concentration in this liquid. The milk and water covered apple slices will brown as these liquids don’t have any acidity to prevent the process of oxidation. You can take the apple slice experiment one step further with your students. Eventually, the apple slice, with the lemon juice, will fully absorb the lemon juice and start to brown. If you can, leave all the apple slices overnight and observe the next morning. Now what do you see?